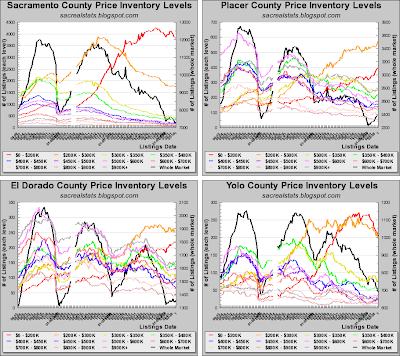 After buying a house in Natomas last month, it seems the buyers are snapping up lower priced homes--at these inventory levels. The banks are releasing REO at a rate I assume to keep the prices stable. They control the market now, not the "organic" buyers, as Mr. Mortgage says. Who else would willingly sell a home at %30+ discount from 18 months ago? 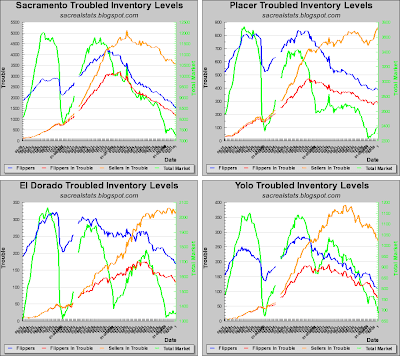 Surprising coming from me, but heard some radio guys this weekend talking about this type of shadow inventory .... lenders not processing foreclosures in order to not show the REO inventory on the books. I don't know if REO is written down further than just late payments, but there's some interesting info.... where's the regulators? Anyhow, I certainly would expect lenders to continue to feed the market with REO inventory, especially is prices stabilize. To get a big "bump" you need to create more inventory..... much of the future REO inventory is already on the market as short sale and new building has been at 15-25% of 2005 production - so it needs to come from large layoffs of people who still own their homes..... hmmm or large payment increases due to resets attached to higher interest rates - not really there. large payment increases due to resets attached to higher interest rates - not really there. I'm thinking "recast." The pay-option and interest-only loans are the next shoe to drop around here. For example, the owners of the place I'm renting now used a 30-year fixed with a 7-year interest only period. No idea what they're actually paying, but an amortized payment would be $1000/month more than our rent. And good luck trying to refi when you're $100k underwater. Also, industry guy I talked to said the banks are ramping up the foreclosure filings, and dropped another 60 files in their lap last week. That doubled their caseload in one fell swoop, and the bank said there's more on the way. They work with only one bank/servicer, and they're Sac county only. Who else would willingly sell a home at %30+ discount from 18 months ago? Who put 30% down on a house 18 months ago? Nobody, that's who. "I'm thinking "recast." The pay-option and interest-only loans are the next shoe to drop around here." Do we honestly have any idea how many of these are left? That credit suisse chart we all know & love is 3 years old now. All those resets and recasts assume no one was able to sell, no one was able to get a workout, no one was able to refinance and no one has already been foreclosed upon. Normal sales and workouts are probably pretty minor but what about refis which have been at a record pace lately - almost all of it is out of ARM products and into 30 year fixed. Looks like alot of that second wave may well have escaped. Also, what about foreclosures? Clearly, the record foreclosures we have seen is not only subprime but also a decent amount of future option arms that washed up early. Bottom line is. Im not saying the second wave is gone. However, once you backout the sales, refis, workouts & purchases 2007-2009 it very well could be we are in the middle of that second wave now and it simply isnt powerful enough to drive inventory or prices. BTW - Max, I really appreciate the civil discourse & intellectual honesty of this blog. 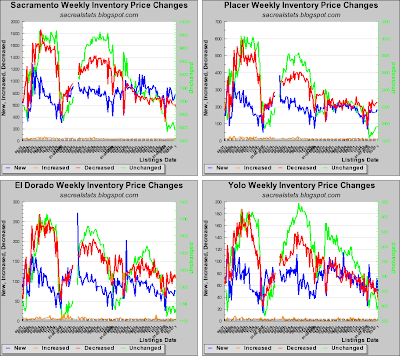 Im generally a bear on my blog, but this latest inventory decline has got me thinking. If I was to question the legitimacy of the all powerful OPTION ARM TSUNAMI on my hometown blog, I would be branded a Judas Iscariot and run out of town! We really have no way of knowing for sure, but you can look at constraints facing the borrower. 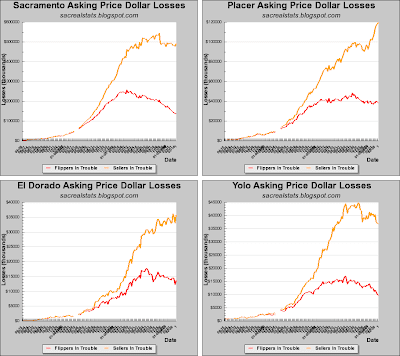 In California, there has really been no period since 2007 where a 100% LTV mortgage could get refinanced without money being brought to the table. Since most of these loans were being offered as "affordability products" anyway, most of these borrowers couldn't afford the fully amortizing payment no matter what, so refis are not an option for most of these borrowers. The only wild card in this mix is the ruthless default "walkaways." If you're a guy with a 7-year pay option with 1 year left and you're 25% underwater, do you keep paying until the recast and hope a rich uncle remembered you in his will, hope for a magic bailout from your rich Uncle Sam, or prepare for the inevitable by writing your mortgage payment to yourself? This will all come out in the wash in the next 12-18 months one way or the other. BTW - Max, I really appreciate the civil discourse & intellectual honesty of this blog. If you want my advice, let the commentariat do its own thing, but make your posts as neutral as possible. They can read into it however they want, but at least you remain intellectually honest. Thanks Max - regarding the defaults I think regarding the 10 & 7 year arms, you are right, maybe the 5 year too - vast majority of underwaters are sitting tight, with a small minority bringing cash to the table to refi. I think few of these are in the ruthless default category. Option Arms though - I have my doubts. The recast chart is supposed to show the ramping up of these now, and for them to be in the oh so desired "high end" categories. 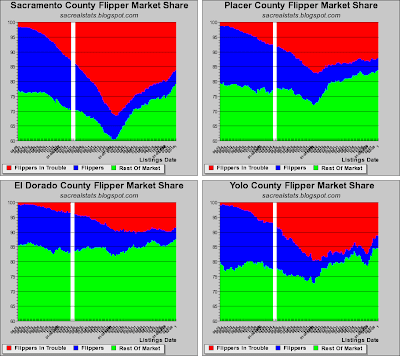 However, where I am looking upper income listings are declining (not as fast as low end but declining still). THis doesnt fit with option arm theory one bit and frankly I find that frustrating. ALso regarding the spring inventory bounce. My answer is no, we wont see one, but at some point I do expect that line to flatten as the banks get to a comfort level with dispensing REOs. Moved into a new 3600 sqft rental. I did look at the tax rolls online to see who was late and there were quite a few. What wasn't expecting was that both of my neighbors would be gone as well. I think those 5 yr recasts are already starting to have an impact. When we signed and took the keys, the landlord told us that many of these large homes were bought by investors 4 and 5 at a time. I asked about the HOAs and he said the developers didn't really care. They sold to anyone. Granted, some have worked out, sold, refinanced but the general feeling is that hasn’t happened in mass numbers. My rental is also underwater by about $150k right now and the owner put down 20%. There is a lot of antidotal references as a lot of data is difficult to access, quantify and confirm accuracy. Flat could be the new bounce in certain areas, others not so. 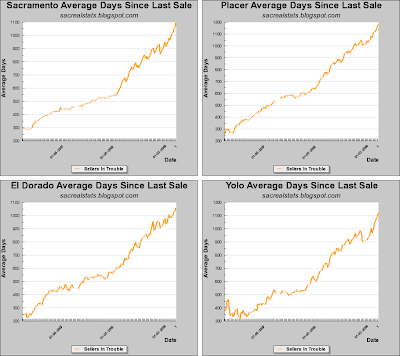 In Folsom and EDH I still see the a monthly price point being hit, then in a week or so a few break through and are purchased. Then a number follow, and then a breakthrough again. 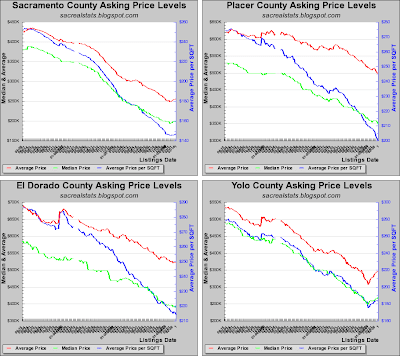 A bottom will be found, but it appears not to be happening in EDH or Folsom yet. 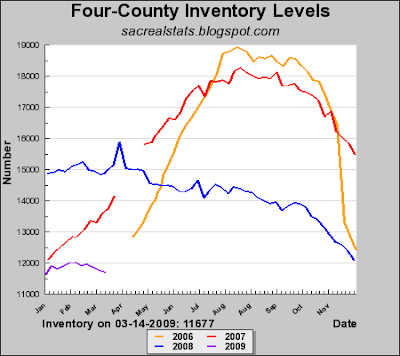 Another note, I check the Sac County assessor’s site for my rental and taxes are owned for December 2008. Which if I understand correctly the payment is made out of the escrow account, if payments are missing during the year and the account does not contain enough funds it is not paid… thus delinquent. No NOD has been filed on the house yet though. It is just a matter of time. Yeah, I would start making moving plans. April taxes are just around the corner, and the county could start foreclosure proceedings if they aren't paid. You should call your landlord as soon as the NOD is filed or the April taxes aren't paid, and see where he stands. No reason to keep lining his pockets if the house doesn't belong to him anymore. Granted, some have worked out, sold, refinanced but the general feeling is that hasn’t happened in mass numbers." Refis out of arms have been at record rates. "Of conventional, prime borrowers originally under a one-year ARM that refinanced in the third quarter of 2008, 94 percent refinanced into a conforming fixed-rate loan. About 82 percent of borrowers originally under hybrid ARMs refinanced into fixed-rate mortgages, according to Freddie’s survey." As to whether this constitutes "mass numbers" honestly I dont know. What I really wish was that someone would update that old credit suisse chart to account for all the washouts, refis, etc. and really tell us what is left. "If I was to question .... I would be branded a Judas Iscariot and run out of town!" Unfortunately, I think this is already happening to some of us with more moderate views. I would really love to see an updated chart as well, and have scoured the net looking for one. I know of several in the state who have refinanced out of ARMs, but no one that I know of has been able to refi out of the Option ARM. I know of several in the state who have refinanced out of ARMs, but no one that I know of has been able to refi out of the Option ARM. The key is the "option" part, not the "ARM" part. 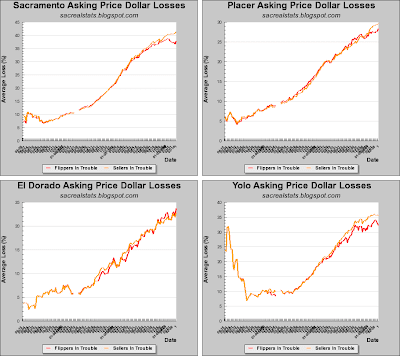 Two years ago, we were all afraid that the interest rate adjustments would kill these guys. That's obviously not how it turned out. Remember that ARMs are still fully amortizing; the people who are screwed are the ones who took the interest-only "option" when paying their mortgage each month. When their loan is recast at the end of their option term, it goes into full repayment mode with a reduced term. Talk about payment shock! When these products were originated, everybody thought the borrower could refi into a new 30-year loan, or sell the house for a profit. Not the case anymore. So the question is, how many of these pay-option loans are still out there waiting for their recast? Also, I wouldn't trust any of the counts comparing the different ARM flavors. The media confuses the different types, and might conflate the "ARM reset" problem with the "option recast" problem. I thought I had five years, at least with the County. The bank is another story, but an NOD has to come first and it will. There you go. The guy is probably using an impound account, so it's a safe bet he hasn't paid his mortgage for some time already. Try this: call him up and ask him for a 50% rent discount. Tell him you know he hasn't paid his mortgage, and if he's making free money off the deal, you want a piece. If he refuses, you know what to do. Wouldn't get that excited about unpaid property taxes, its been quite common as the overall interest rate is not bad after a year. A large % of property investors lag or delay paying until sale - good or bad times. Also, its a no show on the credit report. Wells (example) just discounted their loans a point... went from 1 point to 0 points for fees, 4.6-4.8% interest rate. Title companies and lenders are swamped. Now is the time to jump in. Soon, interest rates will spike hard and lending will effectively be shut down entirely. If you want a house and have reasonable job prospects and good credit, don't wait. You have maybe 3-6 months at most, maybe a lot less. If you have a ton of cash and want to buy with no financing at all, then you can wait until the interest rate spike and really mop up as you will have zero competition except from other land barons. For the rest of us, now is the time. Ben just made the fatal mistake many of us thought he would by opening the door to quantitative easing with the Fed printing and buying the long end outright. He will soon learn that we are not Japan and the US has massive deficits, net importer, no personal savings, etc. This will cause spreads to blow out and ultimately cause a bond market collapse as everyone holding treasuries will hit the Fed's bid again and again and they will solidify their role as lender of only resort - massive crowding out accelerating into a bond collapse. This is essentially a repeat of the 1931-32 bond market rout that brought about GD2 in it's full glory. These collapses can happen with extraordinary speed once foreign central banks (like China) realize that the gig is up. "I believe the Bernanke Fed committed a historic mistake this week – compounding ongoing errors made by the Activist Greenspan/Bernanke Federal Reserve for more than 20 years now. I find it rather incredible that Discretionary Activist Central Banking is not held accountable – and that it is, instead, viewed critical for the solution. Apparently, the inflation of Federal Reserve Credit to $2.0 TN was judged to have had too short of a half-life. So the Fed is now to balloon its liabilities to $3.0 TN, as it implements unprecedented market purchases of Treasuries, mortgage-backed securities, agency and corporate debt securities. And what if $3.0 TN doesn’t go the trick? Well, why not the $5 or $6 TN Bill Gross is advocating? What’s the holdup?" As I’ve argued on these pages, our highly inflated and distorted system requires $2.0 TN or so of Credit creation to hold implosion at bay. It is my belief that this will ONLY be possible with Trillion-plus annual growth in both Treasury debt and Federal Reserves liabilities. Private sector Credit creation simply will not bounce back sufficiently to play much of a role. Mortgage, consumer, and business Credit – in this post-Bubble environment - will not return to much of a force for getting total system Credit near this $2 TN bogey. In this post-Bubble backdrop, only government finance has a sufficient inflationary bias to get Trillion-plus issuance. But the day that policymakers try to extract themselves from massive stimulus and monetization will be the day they risk an erosion of confidence and a run on both government and private Credit instruments. Also as I’ve written, once the government printing press gets revved up it’s very difficult to get it to slow down. This week currency markets finally took this threat seriously." That's the catch though, our job outlook is eroding. I enjoy all the comments that have been posted. 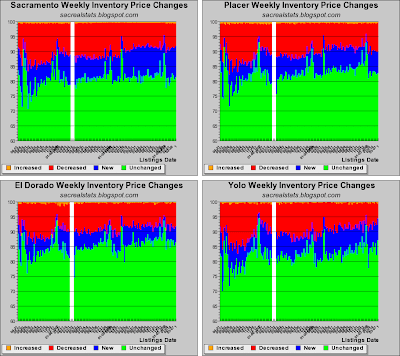 Has anyone analyzed the Sacramento housing market based on affordability recently? 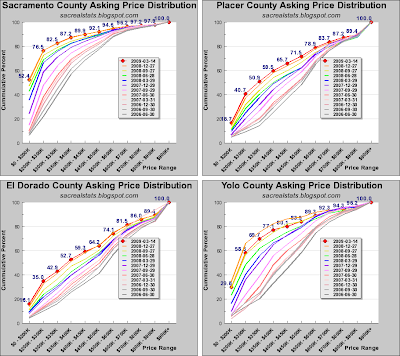 Price/Income ratio and Price/Rent ratio ie. 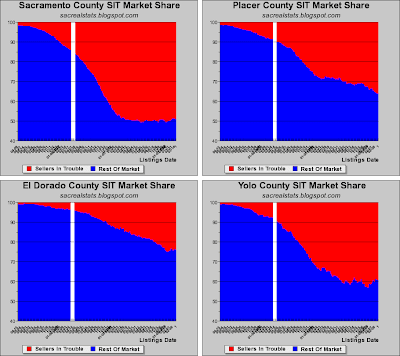 http://findingbottom.blogspot.com/2008/07/introduction-and-data-for-72808.html I am very interested to see where Sacramento is when analyzed this way. What are snarks reference in original blog?